By Andrea Diamond. May 9, 2017. 9:00 AM. Once upon a time, there was no Neverland. The Lost Boys weren’t fighting with Captain Hook, Wendy wasn’t flying past Big Ben with Peter, and nobody took a second look at a firefly to check if it was Tinkerbelle. The world was a little less magical and a little less exciting—until J.M. Barrie changed everything. Born on May 9, 1860 in Scotland, J.M. 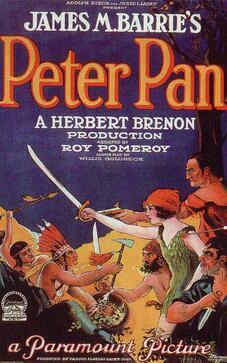 Barrie is best known for the creation of Peter Pan (originally titled The Boy Who Would Not Grow Up) in 1904. The characters of this magical tale were based on the Llewelyn Davies boys, whom Barrie met in Kensington Gardens in London while they were out with their Nurse, Mary. Barrie became a close friend of the family. This friendship ultimately resulted in Barrie becoming the boys’ guardian after the death of their father in 1907 and their mother in 1910. 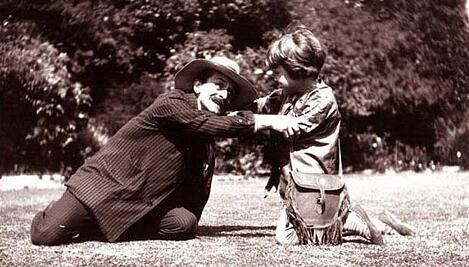 Although George, John, Peter, Michael (pictured above, playing with Barrie in 1906), and Nicholas inspired the creation of Peter and the Darling children, their real lives were far from a fairytale. George died fighting in World War I at the age of 21, Peter committed suicide after a long battle with alcoholism at the age of 63, and Michael drowned under mysterious circumstances—though it was suspected to be a suicide—at the age of 20. Only two of the boys (John and Nicholas) died in old age of illness or natural causes. In addition to the pain brought on by the deaths of George and Michael, Barrie also carried the burden of an unhappy marriage. Barrie met Mary Ansell in 1891 when she acted in his play Walker, London. The pair married in 1894 and had no children. Ansell went on to have an affair in 1908 with a man 20-years her junior, which led to the couple’s divorce less than a year later. Perhaps it was the compilation of these experiences that inspired Barrie’s darker works later in his career including The Twelve-Pound Look, Half an Hour, and Mary Rose. While all of Barrie’s works were well received, none reached that same level of success as the story about a mischievous boy who refused to grow-up. Barrie died June 19, 1937, but Peter Pan is still very much alive. He can be found on stage, in a book, and on the big screen. Of course, if you’re lucky, you might also see him outside your window, flying to the "second star on the right and straight on ‘til morning."